Finding the perfect boot which is durable, stylish beyond trends, and comfortable can be a challenge. Especially if you want to stay within a specific price range. The Chelsea boot is a well-loved silhouette, perfect for day-to-night fashion, with the ability to alter an otherwise casual outfit into a sophisticated ensemble. The best Chelsea boots are narrow-toed and have a secure, slim ankle. The Common Projects Chelsea Boot has masterfully created a neutral, yet impressive, boot that has the quality you need. The price point is a few hundred dollars more than cheaper competitors, but you won’t get the same luxurious leather or sleek profile that Common Projects delivers with their stunning Chelsea Boot. Like most shoes, the Common Projects Chelsea Boot does go on sale occasionally. 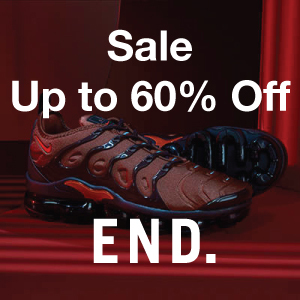 If you even hear a whisper of a sale, you will want to get online to make your purchase as soon as possible! The most popular sizes and colors sell out extremely quickly so do not delay. As soon as I heard of the shoes being on sale I quickly purchased my own pair for around $350 last year. They are expensive at full price and I wanted to wait for a sale in case the boots didn’t live up to their reputation. I was extremely satisfied when I received my pair, but to help you get your own pair on sale I will be keeping this page updated for any current Common Projects deals so be sure to visit here often to be notified of the latest sales. Ensuring that you pick the correct size when ordering your own pair of these great Chelsea boots is relatively straightforward, just choose a full size down from your true size. When I went to buy mine last year, because I’m normally a size US8 in my Converse sneakers, I chose a US7/EUR 40 when I ordered my Common Projects Chelsea Boots. You’ll want your Chelsea boots to have a snug fit to your feet for the best look and the most comfort. The Chelsea Boot from Common Projects is a remarkable shoe, keeping the classic form but with a slightly more rounded toe. The shape is sophisticated enough to be worn as part of your evening wear, adding a stylish touch to any outfit. 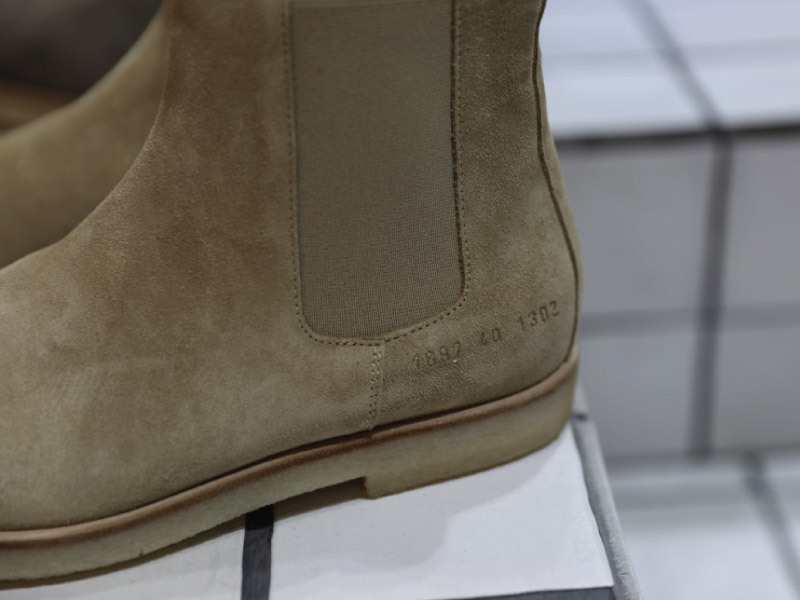 Common Projects manufactures their Chelsea Boots in Italy, a factor in the reasoning behind a higher price point but you’re paying for great quality shoe production and top tier materials. The outsole of the boot is made of Crepe rubber, a strong material that is often used as an alternative to the standard leather sole. Crepe rubber adds a slightly more casual appearance to the boot but there are some downsides to this material because it is textured and porous. When wearing these boots, especially on hard and dirty surfaces, the Crepe rubber will absorb dirt and its pigmentation. The color of the sole will change the more you wear these shoes and once the sole has worn down, you won’t be able to replace the sole of the shoe. However, the Crepe rubber is a sturdy material, so you should be able to wear these for at least 5 years without any issues besides the staining on the outsole. The inner sole is made of high-quality genuine leather which is somewhat soft initially but will continue to become even more comfortable as you wear them in. The lining color is a darker shade of tan, a subtle detail but I liked the contrast in the two shades of the inner and outer lining. 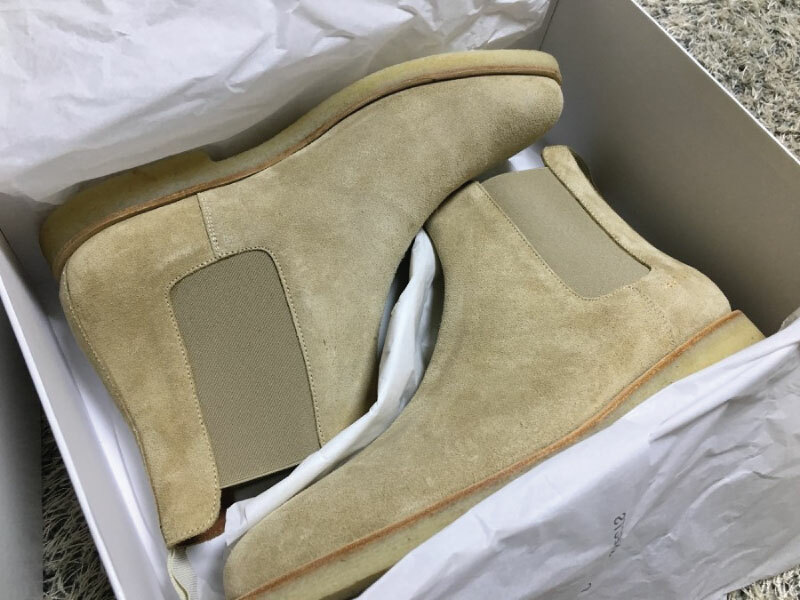 The upper lining of Common Projects Chelsea Boot is made of luxurious suede which is of superior quality to cheaper Chelsea boots. The first time I held these boots I couldn’t get past how soft and clean the suede was, confirming that these shoes, in my opinion, are certainly worth their price. 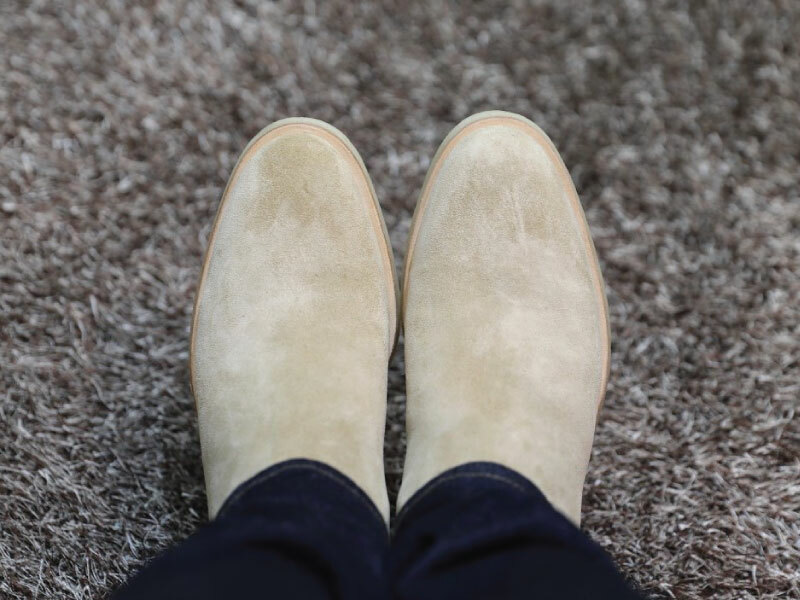 The high quality of the inner and upper lining means that the boot shape will maintain its integrity and I found that the more I wore my Chelsea boots, the better the fit and I felt that the overall comfort of the shoes increased significantly. Investing in a timeless classic like a Chelsea boot is an investment in a piece which will withstand the test of time, both physically and in terms of style trends. The Common Projects take on the Chelsea boot lives up to what the brand claims to offer with their shoes. I do think the full price is quite high so purchasing these boots when they are on sale is worth it. 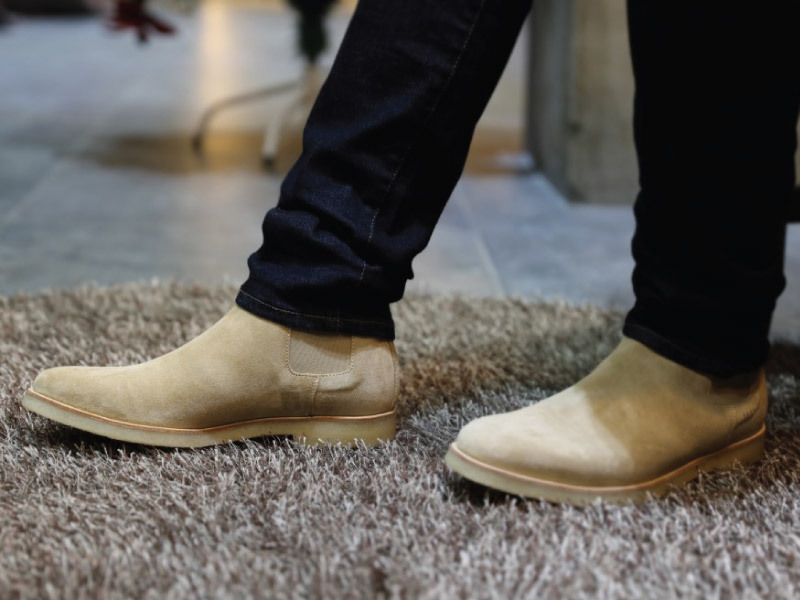 If you consider how quickly cheaper Chelsea boots wear out and deteriorate, it is worth investing in a higher quality boot because, in the long run, you’ll end up saving yourself time and money. 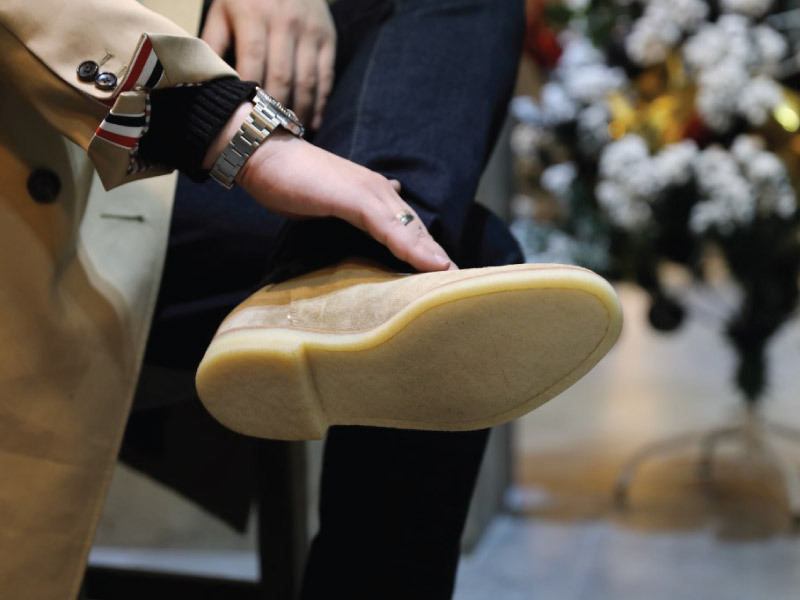 Even if you decide to purchase the Common Projects Chelsea boots at full price, you will get your money’s worth because of how neutral the shape and color are, making the boots extremely versatile. They style best with slimmer pants, such as skinny jeans, and you can pair them with outfits you’d usually wear with sneakers, but these boots will add a touch of elegance without feeling overdressed. The Common Projects Chelsea boots are an overall great shoe which presents a silhouette that will never go out of style. You don’t need to purchase Bottega Veneta or Yves Saint Laurent to get top-quality suede or splendidly comfortable Chelsea boots. 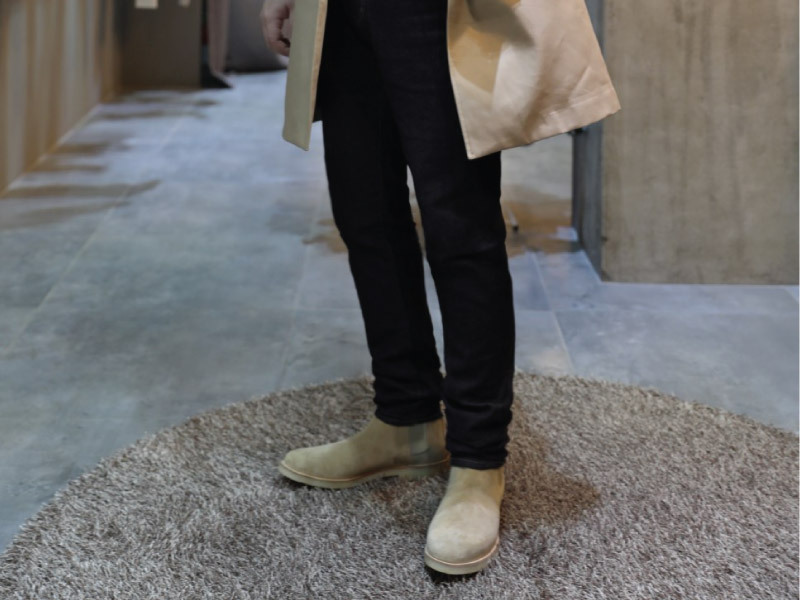 If you buy yourself a pair of Common Projects Chelsea boots you will not regret it!